I had a hot dog on the weekend. Usually this is not cause for a whole post, but this was more than a hot dog, it was a Fat Frank hot dog! My plight with Fat Frank’s has been long and arduous. It started in June when Cindy and I walked to Fat Frank’s on Whyte Ave and found them closed. 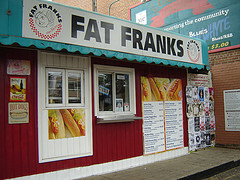 Other trips down Whyte Ave were greeted with a closed Frank shack. In a cruel sense of mockery, the times I had already eaten or it was not hot dog o’clock Fat Franks would be open. I have seen the small Frank stations around Edmonton but was never in a situation to try one…until Saturday! Jenna and I were running errands on Saturday and after a morning that had trips to AMA and Mountain Equipment Co-op we needed some supplies at Canadian Tire. It was early afternoon, several hours since we had breakfast and in the shadows of the entrance stood a magician commanding a portable Fat Frank’s stand. Like an oasis in the Sahara, I had a Fat Frank. It may not have been a gourmet style one that you would find on Whyte Ave, but it was still delicious. Perhaps after having my first Fat Frank my luck will change and the next time I take a walk down Whyte Ave they will be open. Love love love it! I also think your shopping trip list is remarkably similar to Scott and mine. If “Stuff White People Like” was Canadian I am sure it would have a weekend itinerary that included MEC and Canadian Tire.